Social media marketing was great back in the day. But times have changed since 2010. 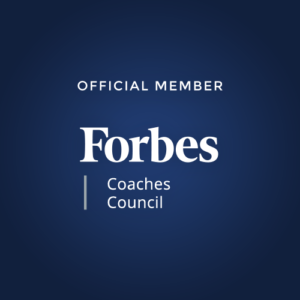 It was easy to get page “likes,” drive traffic, generate quality leads, and get conversions by publishing a few posts on social media. However, the space quickly became immensely competitive and noisy, making it more difficult than ever to get results. New social media platforms emerged. The attention of audiences was further divided. And commanding a strong presence on social media became increasingly difficult. And then something horrendous happened. The organic reach and associated engagement on social media started plummeting. 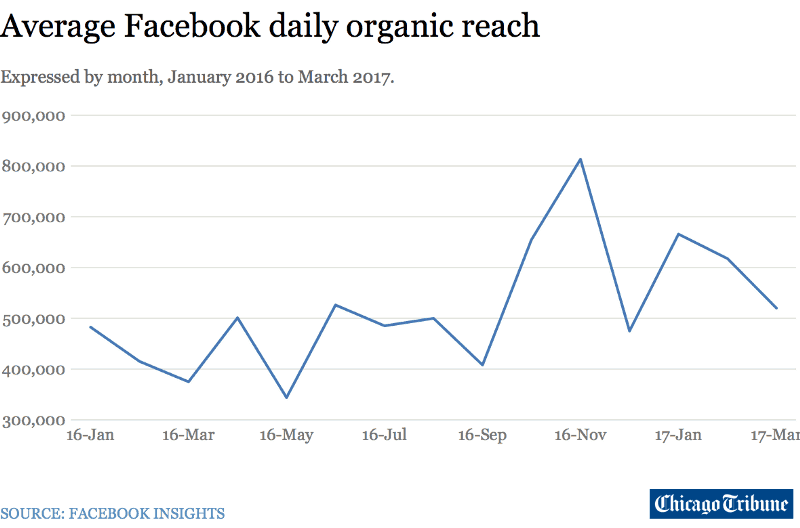 Publishers using Facebook have been witnessing a constant decline in their organic reach for years now. In fact, The Chicago Tribune reported having witnessed a significant decline in their Facebook post reach in January 2017. That isn’t all. It gets worse. Instagram completely disrupted their chronological order of displaying content in your feed. They replaced it with an algorithm that focuses on showing the content you’re most likely to be interested in. As you can imagine, it turned out to be a nightmare for brands because it became increasingly difficult to get visibility. As if that wasn’t enough, Facebook recently announced the biggest update to their newsfeed algorithm – “Zero Update.” This algorithm change has made organic reach and engagement tougher than ever for brands and marketers. Okay, so here’s the brutal truth. This is happening. It was always going to happen. And it’s going to keep happening. Why? Because social media sites have discovered the profitability of advertising. And they’re rapidly turning into paid marketing platforms. Does that mean there’s no way for marketers to continue to reach and engage their audiences organically? You still have Facebook Live and Instagram Stories at your disposal. 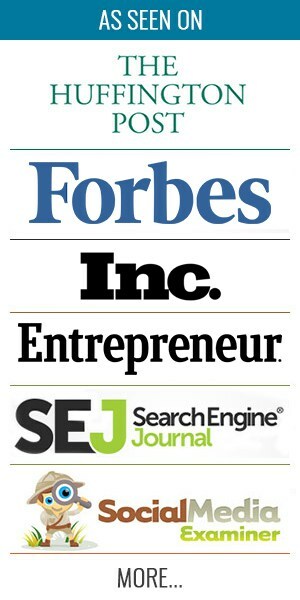 Incorporating these into your marketing mix can help you reach and engage your audiences organically and effectively. Let’s talk about Facebook Live first. Soon after its launch in April 2016, Facebook Live became a valuable tool for media companies and brands. 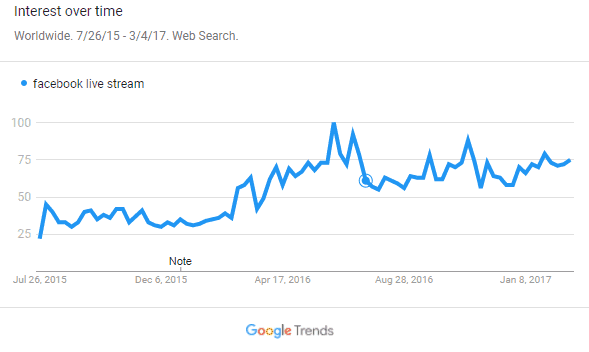 In fact, search interest for “Facebook Live Stream” has increased over 330% since the official announcement of Facebook Live. Facebook Live has changed the way users perceive and interact with videos opening up a window of opportunities for publishers. You might be surprised to learn that people watch Facebook Live videos 3 times longer than pre-recorded videos. This signifies that Facebook Live can help boost your organic reach as well. In fact, the Head of News Feed at Facebook, Adam Mosseri, revealed in a blog post that live videos will continue to show up higher in News Feeds even after Facebook Zero is rolled out completely. In an experiment, Socialbakers found that live videos outperformed all other content on Facebook. 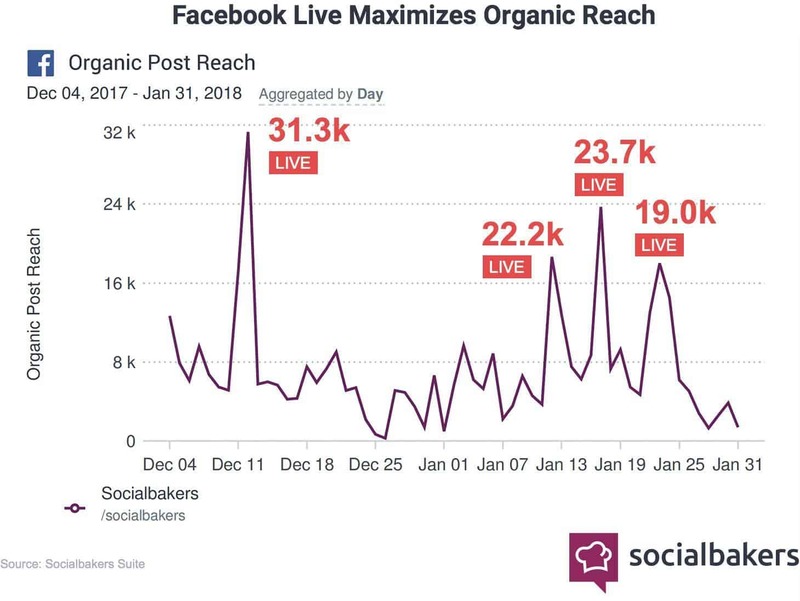 Here’s an example that shows how Facebook Live videos drove 300% more organic reach and engagement. 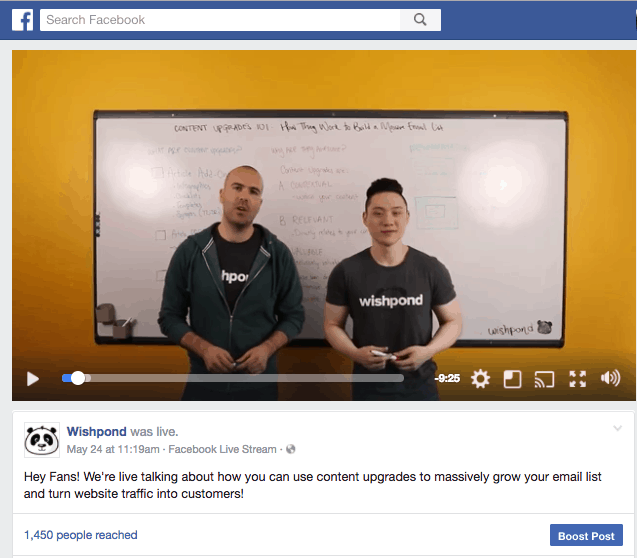 Wishpond put Facebook Live to test against other content types to see the impact on engagement and organic reach. Here’s how Wishpond’s live videos fared against other types of posts on Facebook. 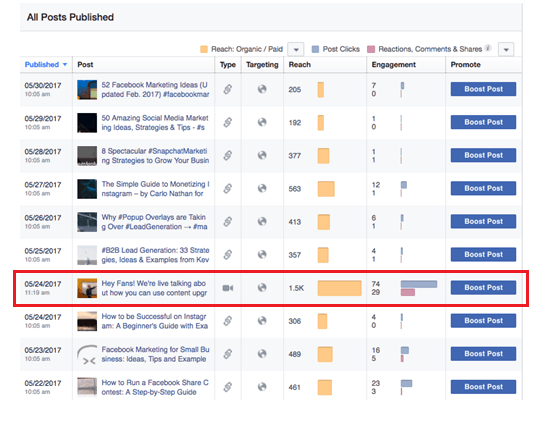 Typically, Wishpond’s Facebook posts used to reach an average of 374 people. However, this time, their Facebook Live video reached 300% more people than usual. Reach isn’t the only thing that Facebook Live videos are good for. They can also drive immense engagement for brands and publishers. Facebook Live videos can generate an average of 6X greater interactions than regular videos. In fact, Buzzsumo recently conducted a study on Facebook video content. They found that around 25% of all interactions on Facebook Live videos are comments. Let’s look at another example of how Smirnoff increased brand engagement with Facebook Live. Smirnoff ran a social media contest asking fans and followers to post a selfie. 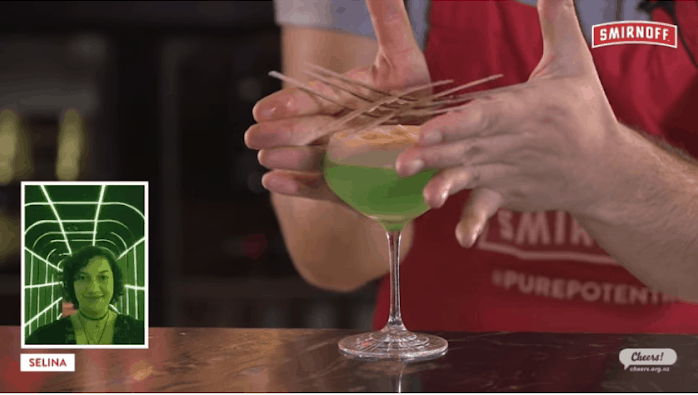 The company used the winning entries to create cocktails and the activity was streamed live on Facebook. The results of the contest were outstanding. Smirnoff was able to amass over 600 selfie entries and thousands of votes. The live video generated 2.8 million impressions and 239,000 views by audiences. It also reached 451,000 people and generated 46,000 interactions. By now, I’m sure you realize the kind of impact Facebook Live videos are capable of. But before you start leveraging them for your business, let me show you how you can multiply this impact many times over. How? By including Facebook Live as part of your influencer marketing strategy. Here’s how Best Fiends was able to maximize their organic reach and engagement using Facebook Live and influencer marketing. Best Fiends was looking for ways to drive awareness and boost the number of app downloads. So, they collaborated with Laura Clery, an influencer having more than 3 million followers on Facebook. In the live video for Best Fiends, Laura showed her audiences how to play the game. This campaign turned out to be a clear winner. The video earned 8,300 likes, 464,000 views and 9,000 comments. Users were quick to respond and more than 13 comments were received every second. Not only did this help in increasing brand awareness but also the overall perception of the brand. Here are a few things that you must keep in mind when using Facebook Live videos in your marketing strategy. Think about what you want to accomplish with your Facebook Live videos. Do you want more page likes? Or are you looking for more email subscribers? Remember, your strategy will have a greater chance of success if you have a concrete plan in place. Optimize your Facebook Live videos to maximize the reach and engagement. Add compelling descriptions and persuasive calls-to-action. Also, don’t forget to add video tags. Remember to track, monitor, and analyze the performance to get the most out of your Facebook Live campaigns. Check the performance of organic vs. paid, auto-played vs. click-to-play, or unique vs. repeat videos. Team up with a popular influencer from your industry. Use Facebook Live and stream their exclusive interviews. Leverage your influencers’ Facebook live video content as part of your paid media strategy. Using a platform like Lumanu you can put paid media behind your influencer content and make sure it reaches your ideal audience. This is an amazing way to deliver targeted content and not rely on organic reach. Facebook Live integrated with a well-thought-out influencer marketing strategy can help you easily boost your organic reach and engagement. Let’s move onto Instagram now. You might already know that Instagram has the highest number of users after Facebook with 800 million monthly active users. 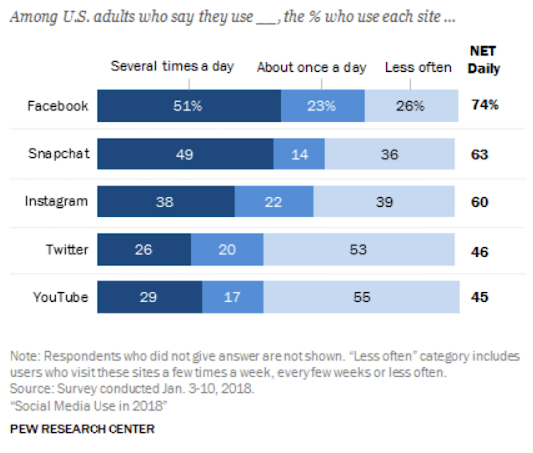 And 60% of Instagram users in a survey said that they visit the platform daily. No wonder why more than 25 million businesses are using Instagram for advertising and building brand awareness. However, ever since Instagram changed to their algorithm in 2016, the organic reach on the platform has been steadily declining. Fortunately for advertisers, Instagram Stories were introduced, which turned out to be a game changer. Instagram Stories quickly became immensely popular among users, content creators, and businesses alike. Launched on August 2, 2016, Instagram Stories now has over 300 million people using it on a daily basis. Instagram Stories have revolutionized the way users engage with branded content on the platform. People spend an average of 28 minutes on Instagram Stories every day. Those aged below 25 years spend more than 32 minutes daily on Instagram. And those over 25 years spend more than 24 minutes every day on the platform. Instagram can help you reach relevant audiences and engage them easily and effectively. 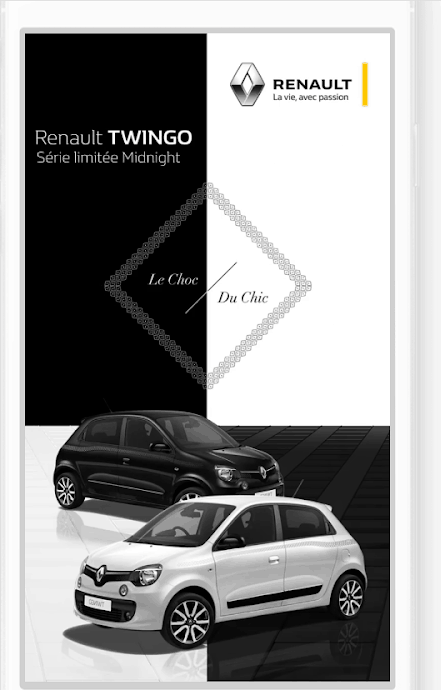 For example, Renault wanted to promote their new model of Twingo Midnight among millennials. So, they leveraged Instagram Stories for a month long campaign. The results included a 9-point increase in ad recall, a 3-point increase in awareness, and a 4-point increase in favorability among millennials. Now here’s the big question. How can you expand your reach on Instagram and boost engagement without having to spend millions on expensive ads? By leveraging the power of influencers, of course. In fact, 59% of micro-influencers found Instagram to be the best social media platform for engaging their audiences. Even for marketers, Instagram is the top choice with over 90% of them using the platform for influencer marketing. 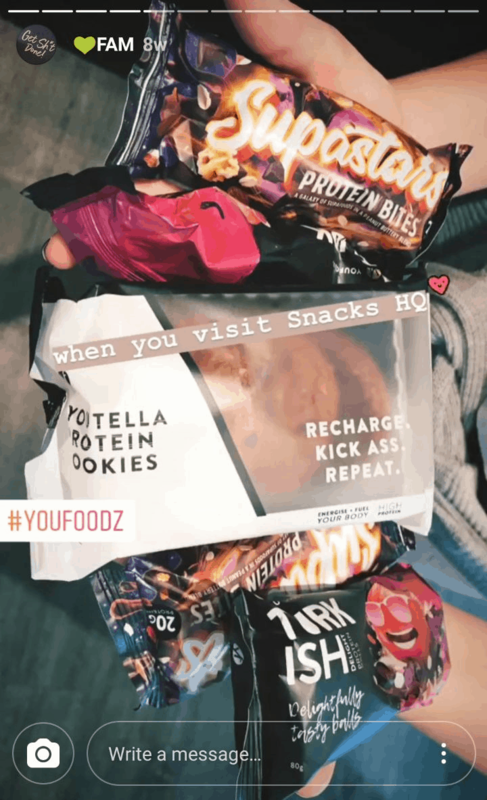 Youfoodz partnered with several Instagram influencers recently for an interesting campaign. Their goal was to create awareness about the launch of their new winter menu. So, they collaborated with influencers in fitness, food, and health niches to get their message across. The campaign involved 167 pieces of content and more than 162 Instagram Stories. The results were nothing short of impressive. More than 500K impressions, over 69K engagement, and more than 1.45 million reach on Instagram and Facebook. Here are a few things to keep in mind when using Instagram Stories. Use high-quality images or videos that resonate well with your audiences. Leverage hashtags, geolocation, polls, stickers, and gifs to make them more engaging. Most importantly, work with influencers for your campaigns to maximize the reach of your brand. Make sure that your influencers add calls-to-action to their Stories in order to guide their followers on what to do next. In order to track and measure the performance of your Instagram Stories, make a note of the following metrics. Taps Forward: The number of times someone taps on the right side of the screen to move to the next story. Taps Backward: The number of times someone taps on the left side of the screen to watch the previous story again. Exits: The number of times someone swipes down to stop watching and go back to the main feed. Replies: The number of times someone swipes up and reacts to a story. In addition to the benefits listed above, one of the top advantages of Facebook Live and Instagram Stories is how they help collect valuable audience data. You can create a custom audience based on video views to reach the people who are the most likely to engage with your brand content. Your video viewers (both on Facebook Live and Instagram Stories) have already engaged with your content. So there’s a good chance that they will continue to engage with the content you deliver. You can target this audience in your remarketing campaigns to drive higher engagement. You can further extend this strategy by collaborating with third-party content creators (influencers). Gain access to the third-party audience data using tools like Lumanu and then remarket your brand and products to this audience. Facebook Live and Instagram Stories are perhaps the best forms of content to engage your audiences. They allow you to humanize your brand and connect with your target audiences through authentic storytelling. So go ahead and leverage them to boost your organic reach and amplify user engagement around your brand. Have you used Facebook Live or Instagram Stories for your marketing? I’d love to hear your stories, so please share your experiences in the comments below. Nice piece, especially including case studies as examples at increasing organic reach through live videos and stories! It’s interesting to see the shift to live video with these two platforms, something that businesses should take advantage of to add more personality to their brand. Agreed! Adding personality to your brand through video can be huge!